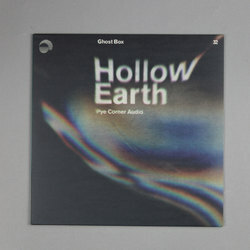 Pye Corner Audio - Hollow Earth. Vinyl LP, CD. Bleep. Pye Corner Audio presents Hollow Earth, the long-awaited sequel to Our Head Technician's last Ghost Box broadcast Stasis. Hollow Earth is a vessel that sinks itself deep into notions of submerged psychologies and subterranean exploration. Hollow Earth buries itself deep into Bowie b-side synth improvisations, New Age meditations while the ghosts of 90s house euphoria blur the edges. 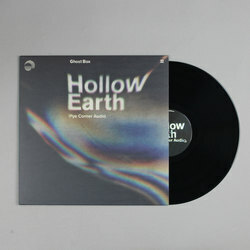 The subterranean element of Hollow Earth plays a pivotal role in the album's journey, diving deep into the core of the earth and drifting between vast, awe-inspiring spaces and into the sort of claustrophobic chambers that defined recordings such as Sleep Games and Black Mill Tapes. With the track titles offering a map through this new landscape, the audio soundtracks a multitude of labyrinths, lakes and buried memories before reaching the surface in the albums closing minutes. 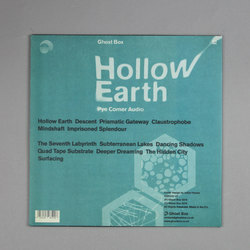 Having been absorbed in this album for the past few weeks, we can honestly say that Hollow Earth is by far the most accomplished album in the Pye Corner Audio discography to date. A true milestone of Radiophonic techno, one that blurs the boundaries and edges of the sound library while shaking all that listen right to the centre of the once molten, but now Hollow Earth.